The desert sky is brilliant blue as you ride through the arroyos and washes toward the summit of South Mountain. Slowly you rise in elevation, surrounded by beautiful desert flowers and towering Saguaro cactus. Desert rabbits and quail dart across the narrow, less- trodden trail passing through intricate rock formations, leaving the city of Phoenix behind. The air is clear and dry as you pass through the spectacular scenery of the Sonoran Desert. Phoenix sprawls across the valley floor as you view it from the quiet of the hills. 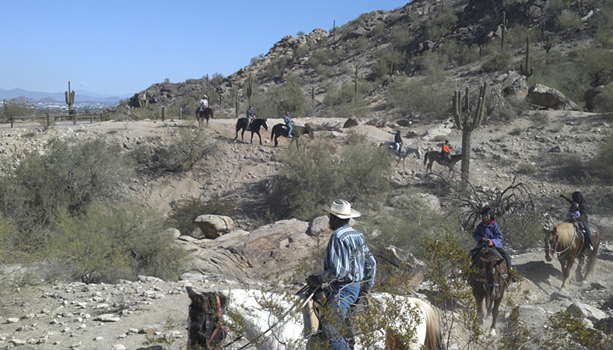 You are in the desert southwest, experiencing it, and seeing it the way it was meant to be seen… on the back of a horse.